Arc Minerals is pleased to announce that initial results from its airborne geophysical and soil sampling programme at the Zamsort Copper-Cobalt project ("Zamsort") in north western Zambia have identified significant new target areas. The initial results indicate several new large anomalies, a number of which stretch for many kilometres. Cheyeza West is the most exciting of the new targets with a core 3km x 3km anomaly outlined by very high Cu values in the soils enclosed by the wider 10km x 8km Cheyeza anomaly. 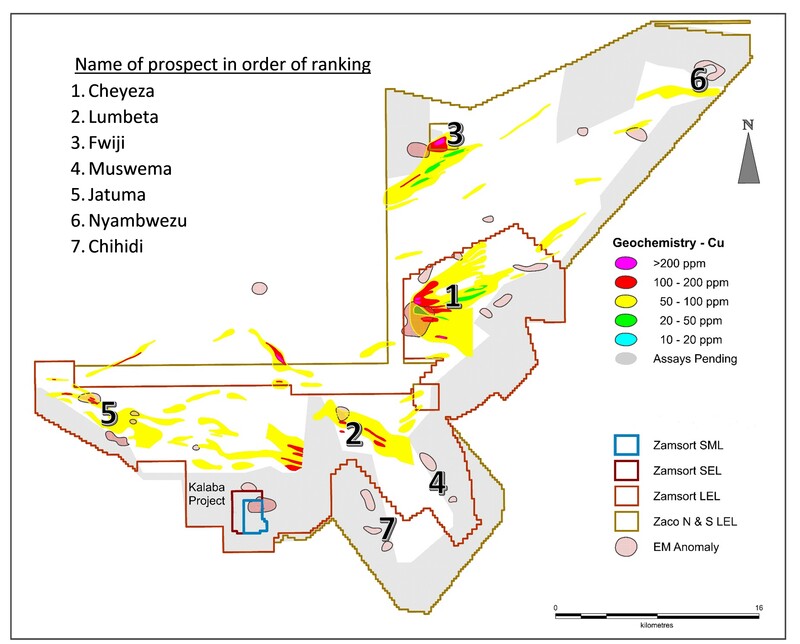 In addition, the co-incident electromagnetic anomaly over this 3km core, indicates conductivity within the host rock, has moved Cheyeza West to the top of the company's internal ranking of its exploration targets. The Lumbeta target, the Company's second ranked and stretching for 11km, is associated with the crest of a fold. These hinge points in a folded environment can act as mineralisation traps and form high grade deposits. Historical drilling at Cheyeza East has intersected zones of copper mineralisation averaging 0.6%. Similarly, at Fwiji and Nyambwezu, grades averaging 0.5% copper have been reported. The location of these new target areas appears to be higher up in the stratigraphy in the central part of the license, which has not been previously explored. The Company continues to assess the results with its external exploration consultants and a more detailed update is expected shortly. "The initial results from the airborne survey and soil sampling programme are extremely exciting and have exceeded all our expectations. It is clear that our licences lie in a very prospective mineral belt adjacent to Zambia's largest copper mines and we believe have the potential to host not one but multiple large new copper deposits. The two new target discoveries, which are close to 10 times the size of Kalaba, with strong soil geochem and geophysical properties/grades, is a potential game changer for Arc Minerals. We have been approached by some very large industry players and are in discussions. We continue to assess the data as it becomes available and look forward to reporting further on this shortly." The Company conducted a comprehensive high-resolution airborne geophysical survey over its Zamsort project. The Zamsort project licenses cover in excess of 850 km² and host a large number of targets in addition to the Kalaba Copper-Cobalt Prospect ("Kalaba") where the Company is currently delineating a Resource for the Commercial Scale Demonstration ("CSD") plant as well as a Maiden JORC-Code Mineral Resource for the deposit based on the drilling to date. The airborne geophysical survey which collected magnetic data and measured radiometric emissions, was conducted by Xcalibur Airborne Geophysics (Pty) Ltd ("Xcalibur"). The survey covered the entire license areas and comprised 5,218 line-kilometres. The survey was conducted using a 200m line spacing and flying along NW-SE flight lines. The Company and its respected external geological consultants have ranked the regional targets based on geological, geophysical and geochemical attributes. A table outlining each regional target is listed below. Note: These are the targets generated by the airborne geophysical and soil sampling programme and exclude the Kalaba Copper-Cobalt project. Geochemistry data is still pending and may affect the ranking of the targets. Strong Cu anomaly strtshing 11km. 6.2km long Cu anomaly with highest pick at 250ppm. Zamsort project Licence areas. This comprehensive soil sampling programme comprising 28,000 soil samples was completed using a 1km line spacing with soil samples taken every 50 metres. The Company has analysed half the soil samples collected to date with analyses of the remaining samples expected to be completed in the coming months. A rapid chemical analysis to access available nutrient status of the soil and includes interpretation, evaluation and fertilizer recommendation based on the result of chemical analysis and other considerations.